Classic winter boot in black with zipper closure, lambskin lining & rubber lug sole. 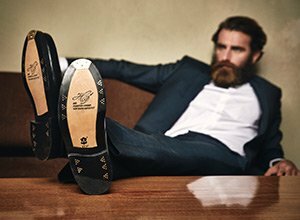 Quality, simple brown shoe care—the 6-piece brown shoe polish set. Six shoe spikes ensure stable motion on slippery ground. Classic Jodhpur boot in dark brown with leather strap and pin buckle. Hardened steel snow cleats promise a sure stance in winter. Classic cap-toe lace-up boot in dark brown with lambskin lining & rubber outsole. Extremely soft and dense horsehair brush with a wooden provides a great polishing. Classic Chelsea boot in dark brown velours with side elastic inserts and pull tab. Provide a perfect grip and ensure a firm stance on winter snow and ice. Classic heeled ankle boot in black with side zipper closure. Classic Jodhpur boot in cognac with leather strap and pin buckle.